People seem to have latched on to the narrative that Dems did badly in the Senate. This is false on its face, since the map was the worst in many years. But, in fact, Dems seem to have done even better in the Senate than in the House, with a "generic ballot" of about 9.4 points, compared to about 8 points in the House. The scatter is a bit larger in the Senate, but less than I'd have expected. There was a lot of chatter about Dems missing expectations, but that wasn't really the case. North Dakota was a lost cause for a long time (and polling pre-Kavanaugh suggests that Heitkamp's vote wasn't the deciding factor). The only competitive races, at least according to the statewide polls, were AZ, NV, FL, MO, IN – and Dems won 2 out of 5. That's pretty much the definition of "exactly what you'd expect." We can also compare to the national environment. 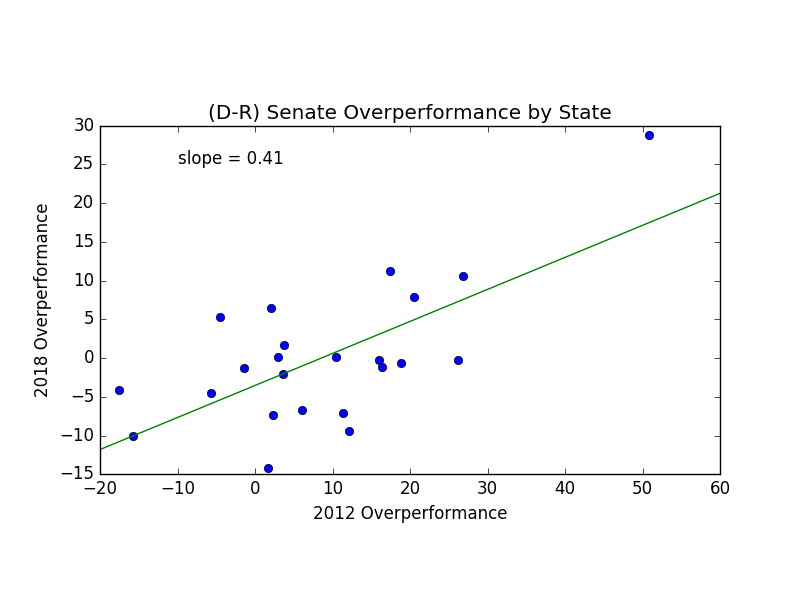 In the plot above, I've identified the 7 races where candidates especially over- or under- performed compared to a simple 2-parameter model: an incumbency advantage and a generic shift – both of which were determined using the final results. Dems seem to have won 2 races they "shouldn't" have: WV and MT (suggesting especially strong candidates), and lost only 1 race they should have won, FL. But the truly surprising thing is how simple the model can be, and still produce such good predictions. Just two numbers gives you everything. 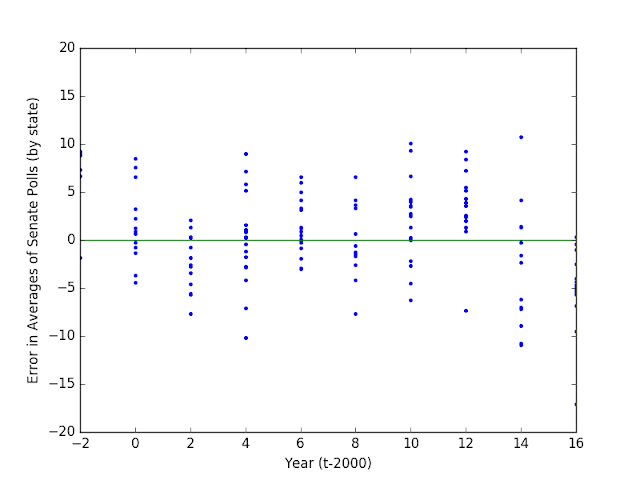 But those outliers are quite interesting. Points that lie "above the line" are basically telling us that a Democratic candidate was especially strong (or a Republican was especially weak), or are they? One way we can look at this is to see whether candidates who over- or under- performed this year also did so in 2012. The correlation isn't overwhelming, but it's positive. For every point that a candidate overperformed their party in 2012, the expectation was that they'd get an extra 0.4 this time around. 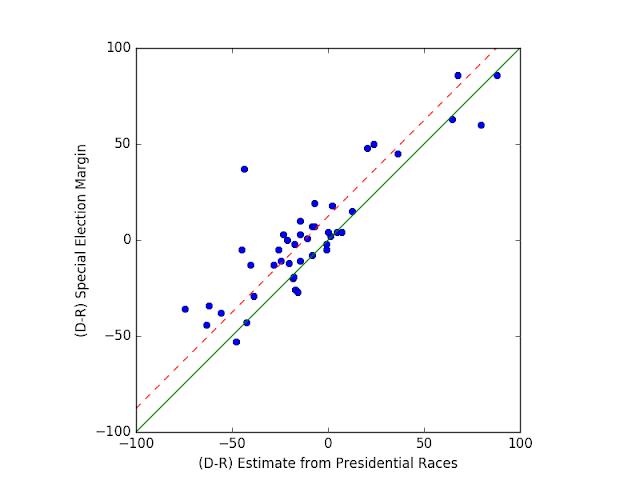 This is very similar to the results from the House. There is such a thing, it seems, as a good candidate. If this seems like an obvious point, it shouldn't. 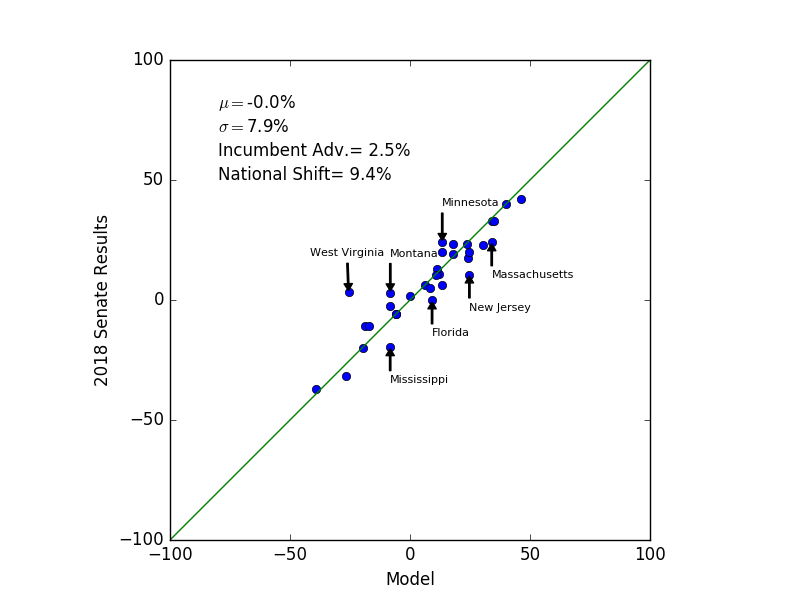 The top plot (and similar results in the House) strongly suggest that the overwhelming factor in predicting a district is its voting history and a few national trend numbers. And yet, there's something ineffable which allows some candidates to perform ~10-20 points better (or worse) than expected. Dems could pick up CO, ME, IA, AZ, NC,GA, and will probably lose AL. Those are using the national trends that we've seen this time around. Realistically, none of the other Dem seats are really on the table.